Huntington’s disease (HD) is a fatal genetic disorder that causes the progressive breakdown of nerve cells in the brain. It deteriorates a person’s physical and mental abilities during their prime working years and has no cure. HD is known as the quintessential family disease because every child of a parent with HD has a 50/50 chance of carrying the faulty gene. Today, there are approximately 30,000 symptomatic Americans and more than 200,000 at-risk of inheriting the disease. HD has been described as having ALS, Parkinson’s and Alzheimer’s at the same time. Symptoms usually appear between the ages of 30 to 50, and worsen over a 10 to 25 year period. Ultimately, the weakened individual eventually succumbs to some other illness. Everyone has the gene that causes HD, but only those that inherit the expansion of the gene will develop HD. Every person who inherits the expanded HD gene will eventually develop the disease. Over time, HD affects the individual’s ability to reason, walk and speak. Symptoms of HD can vary dramatically from person to person. While one person might have more trouble with muscle control and movements another person might have more issues with personality changes and emotional fragility. However, the progression of the disease can be roughly divided into three stages. Subtle changes in coordination, perhaps some involuntary movements (chorea), difficulty thinking through problems and often a depressed or irritable mood. Medications are often effective in treating depression or other emotional problems. The effects of the disease may make the person less able to work at their customary level and less functional in their regular activities at home. Movement disorder may become more of a problem. 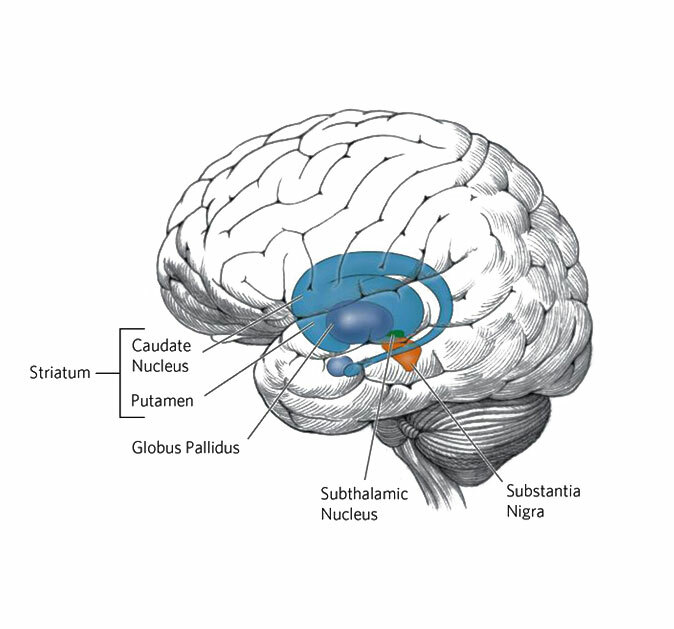 Medication for chorea may be considered to provide relief from involuntary movements. Occupational and physical therapists may be needed to help maintain control of voluntary movements and to deal with changes in thinking and reasoning abilities. Diminished speech and difficulty swallowing may require help from a speech language pathologist. Ordinary activities will become harder to do. The person with HD is totally dependent on others for their care. Choking becomes a major concern. Chorea may be severe or it may cease. The person with HD can no longer walk and will be unable to speak. However, he or she is generally still able to comprehend language and retains an awareness of family and friends. When a person with HD dies, it is typically from complications of the disease, such as choking or infection and not from the disease itself. Given there is no cure, those at-risk for the disease face a difficult choice about genetic testing for HD. Many people see no benefit in knowing that they will someday develop the disease. Others prefer to have more information so that they can make informed choices about the future. The decision whether to test or not is intensely personal and there is no “right” answer. Genetic testing is a simple procedure, but given the weight of the information, it is recommended that at risk individuals get tested at a genetic testing center that includes counseling and support services. Genetic testing for children is typically prohibited before the age of 18, as the child may not understand the full implications of testing and may be vulnerable to pressure from others. However, a child under the age of 18 may be tested to confirm a diagnosis of juvenile onset HD after a thorough neurological exam. Although genetic science is progressing rapidly, there currently is no cure for HD and treatments only treat symptoms, not the underlying disease. However, the technology currently exists to prevent the spread of HD from an HD positive parent to the next generation of offspring. 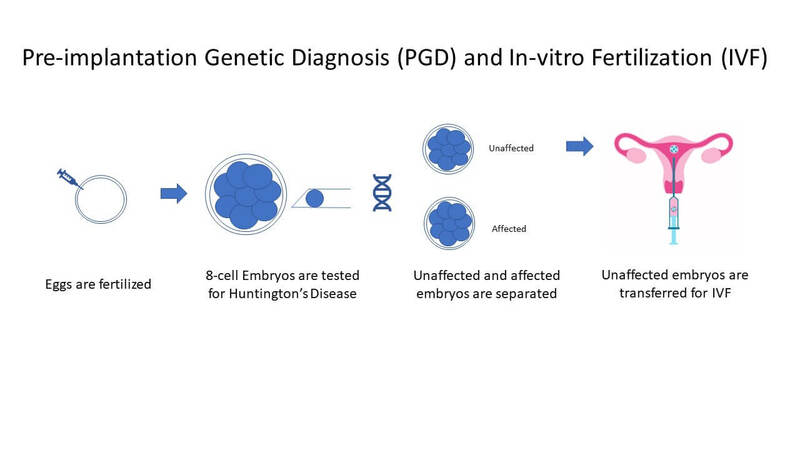 Preimplantation Genetic Diagnosis (PGD) can be combined with In Vitro Fertilization (IFV) to eradicate HD from all offspring. PGD allows for only HD negative embryos to be implanted as part of the IVF process. Thus, guaranteeing the elimination of HD from the child born through this process. This is the sole focus of the End Huntington’s Disease Foundation. The eradication of HD through preventative measures. End HD will sponsor the following procedures in at-risk individuals.